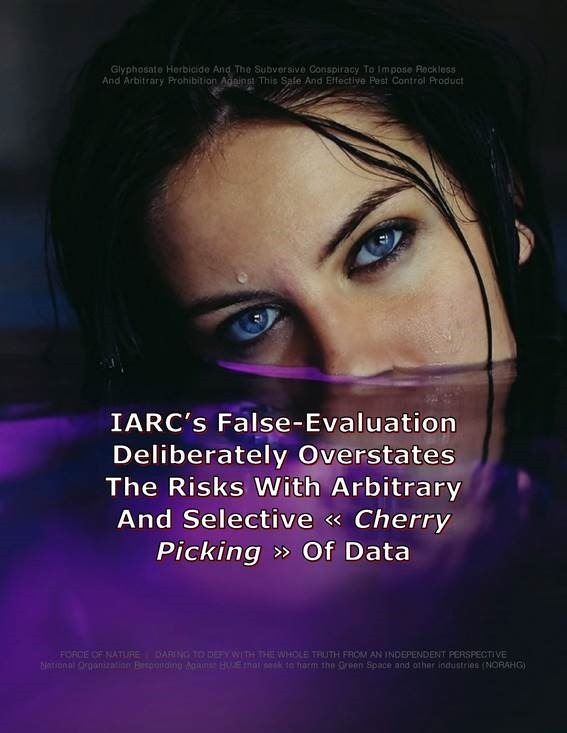 US EPA Review Panel Report Has Discredited IARC ! GLYPHOSATE WILL NOT CAUSE CANCER according to the Review Panel Report published on-line by the Cancer Assessment Review Committee at the United States Environmental Protection Agency ( US EPA ) on April 29th, 2016. The US EPA report DISCREDITED the anti-Glyphosate report by International Agency For Research On Cancer ( IARC ) which CONVENIENTLY DISREGARDED SEVERAL STUDIES on the effects of exposure to Glyphosate purely on the basis that these studies showed NO positive results. According to Monsanto, the company that developed Glyphosate, NO PESTICIDE REGULATOR IN THE WORLD CONSIDERS GLYPHOSATE TO BE A CARCINOGEN, and the US EPA report once again reinforces this important fact. Unfortunately, IARC’s INCONSISTENT CLASSIFICATION of Glyphosate has GENERATED UNWARRANTED CONCERN AND CONFUSION about Glyphosate. 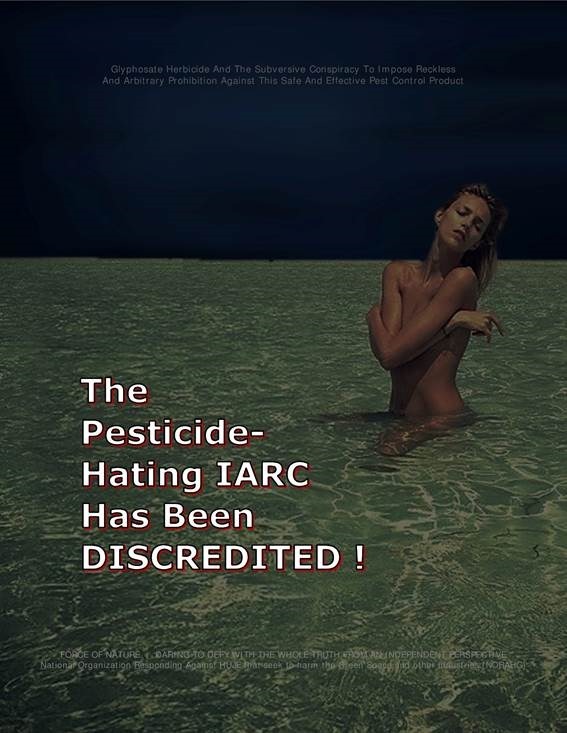 There is something HORRIBLY WRONG when IARC officials CONSPIRE with Pesticide-Hating Fanatics and their Environmental-Terrorist Organizations to DICTATE PUBLIC POLICY based upon reports THAT ARE WRONG ! IARC officials are CATEGORICALLY WRONG about Glyphosate, an ingredient that has been assessed to be SCIENTIFICALLY-SAFE. Seemingly, IARC officials will say ANYTHING in order to validate their ANTI-PESTICIDE AGENDAS, including faking data, designing pointless and inferior research, and prejudicially giving greater weight to research results that only agree with their twisted objectives. Fanatical and Environmental CONSPIRACIES have NOT just been restricted to pest control products, but also Agent Orange, agriculture, artificial sweeteners, cancer, DDT, global cooling and global warming, lawn care, organic food, and wind power. GLYPHOSATE WILL NOT CAUSE CANCER … if you read about it over the weekend. That was the conclusion of a Review Panel Report published on-line by the Cancer Assessment Review Committee at the United States Environmental Protection Agency [ US EPA ] on Friday, April 29th, 2016, FINALLY SHUTTING DOWN A 30-YEAR DEBATE by giving a DEFINITIVE ANSWER to a hotly contested topic. But, by Monday, May 2nd, it was gone. The US EPA Review Panel Report, entitled Evaluation Of The Carcinogenic Potential Of Glyphosate, was published by the Cancer Assessment Review Committee ( CARC ), the branch of the EPA that determines if a chemical causes cancer in humans. 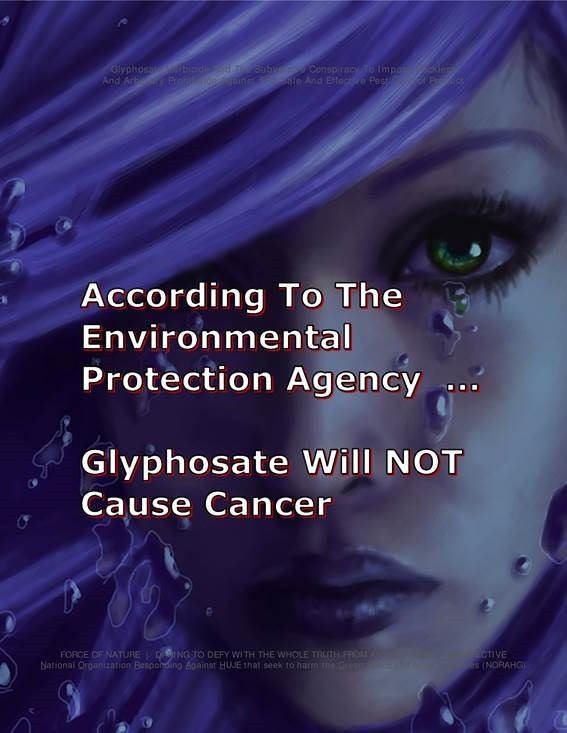 On September 16, 2015, the Cancer Assessment Review Committee ( CARC ) of the Health Effects Division, of the Office of Pesticide Programs, EVALUATED THE CARCINOGENIC POTENTIAL OF Glyphosate in accordance with the EPA’s FINAL Guidelines For Carcinogen Risk Assessment. Attached please find the FINAL Cancer Assessment Document. The FINAL document ― with the word FINAL found on the top right corner of each of the 87 pages. So, that sounds pretty FINAL. Until the US EPA removed the FINAL Review Panel Report from its web-site. In order to fully appreciate why this matters so much, we need to understand a little about THE LONG AND TUMULTUOUS HISTORY OF THIS DEBATE. Glyphosate is the most widely-used herbicide ( vegetation killer ) in the United States. It was originally developed by Monsanto, and first sold in 1974 under the name Roundup. Although people may think that Monsanto and Glyphosate go hand in hand, Monsanto ACTUALLY LOST ITS GLYPHOSATE PATENT IN 2000, resulting in the continued use of Glyphosate into hundreds of products sold by multiple companies. Which brings us to 2015, when the International Agency For Research On Cancer ( IARC ), [ arbitrarily ] recommended an INCONSISTENT CLASSIFICATION of Group B – Probably Carcinogenic. The US EPA Review Panel Report, entitled Evaluation Of The Carcinogenic Potential Of Glyphosate, was highly critical of the IARC’s anti-Glyphosate report, which was BASED ON A REVIEW OF THE SCIENTIFIC LITERATURE THAT WAS NOT COMPREHENSIVE. Long overdue is one, FINAL, all-encompassing EPA Review Panel Report that would FINALLY, once and for all, clarify whether or not Glyphosate causes cancer. And, we had it on April 29th ― until we did NOT anymore. This comprehensive Review Panel Report analyzed multiple different studies, with the conclusion on page 77 entitled CLASSIFICATION OF CARCINOGENIC POTENTIAL. • Glyphosate is classified as NOT LIKELY TO BE CARCINOGENIC TO HUMANS. • The EPIDEMIOLOGICAL EVIDENCE at this time will NOT support a causal relationship between Glyphosate exposure and solid tumors. • There is also NO EVIDENCE to support a causal relationship between Glyphosate exposure and the following non-solid tumors ― leukemia, multiple myeloma, or Hodgkin’s disease. • The epidemiological evidence at this time is INCONCLUSIVE for a causal or clear associative relationship between Glyphosate and NON-HODGKIN’S LYMPHOMA. • In experimental animals, there is NO EVIDENCE FOR CARCINOGENICITY ― dietary administration of Glyphosate at very high doses for up to two years produced NO EVIDENCE OF CARCINOGENIC RESPONSE in seven separate studies with male or female rats. • The same held true with mice. Based on a weight of evidence from a wide range of assays looking at genetic mutation, chromosomal damage, DNA damage and repair, THERE IS NO GENOTOXIC AND NO MUTAGENIC CONCERN FOR GLYPHOSATE. So, why would such a comprehensive Review Panel Report with a clear conclusion be removed from the web-site ?!?! The EPA told Reuters, in an e-mail, that its assessment was NOT FINAL ( a particularly odd word choice for a Review Panel Report presenting their FINAL guidelines ) and that the documents were PRELIMINARY. The EPA also stated that the FINAL ( yes, FINAL ) Review Panel Report will be published later in 2016. GLYPHOSATE WILL NOT CAUSE CANCER, according to a Review Panel Report from the United States Environmental Protection Agency ( US EPA ). Glyphosate is a weed control ingredient developed by Monsanto that is now the most widely-used herbicide in America. Glyphosate is the active ingredient in Roundup Herbicide as well as hundreds of other products made by dozens of other companies. The US EPA’s Cancer Assessment Review Committee made the determination after ANALYZING SEVERAL DOZEN PUBLISHED AND UNPUBLISHED SCIENTIFIC STUDIES concerning Glyphosate. The US EPA’s Cancer Assessment Review Committee FINALIZED its Review Panel Report on October 1st, 2015, but did NOT release it to the public until late April 2016, when the agency inadvertently posted the report on-line. The US EPA Cancer Assessment Review Committee, led by staffers from the Health Effects Division of the agency’s Office of Pesticide Programs, POKED A NUMBER OF HOLES in the INCONSISTENT CLASSIFICATION used for IARC’s anti-Glyphosate report. For example, the US EPA Review Panel Report noted that the IARC’s anti-Glyphosate report CONVENIENTLY DISREGARDED SEVERAL STUDIES on the effects of exposure to Glyphosate because these studies showed NO positive results. The US EPA report also said the studies IARC chose to include in its report had SIGNIFICANT LIMITATIONS ― in other words, THE IARC GIVES GREATER WEIGHT TO POSITIVE RESULTS THAN TO NEGATIVE RESULTS, EVEN WHEN THE LATTER ARE FROM HIGHER-CALIBER STUDIES. Seemingly, IARC officials will say ANYTHING in order to validate their ANTI-PESTICIDE AGENDAS, including the CONCOCTION OF HIGHLY PREJUDICIAL REPORTS AGAINST GLYPHOSATE. IARC has DELIBERATELY OVERSTATED THE RISKS with its arbitrary and selective « cherry picking » studies against Glyphosate. Release of the IARC’s anti-Glyphosate report had serious negative consequences for the agricultural chemical industry. IARC’s anti-Glyphosate report was the BOGUS-basis for a decision by the State of California to require all products containing Glyphosate to be listed as carcinogenic [ ?!?! ] , a decision that Monsanto is CHALLENGING IN COURT. NO PESTICIDE REGULATOR IN THE WORLD CONSIDERS GLYPHOSATE TO BE A CARCINOGEN, and this conclusion by the US EPA once again reinforces this important fact. Unfortunately, last year’s [ 2015 ] INCONSISTENT CLASSIFICATION by IARC generated unwarranted concern and confusion about this important agricultural tool. The findings of the US EPA’s Cancer Assessment Review Committee are part of a broader look by the agency at the overall health and environmental effects of Glyphosate as a part of its registration review program, which conducts risk reviews of every pest control product once every 15 years. If the US EPA determines that the science shows that THE WAY GLYPHOSATE IS BEING USED NOW EXCEEDS ACCEPTABLE RISKS, it can enact use restrictions on the ingredient, or take it off the market altogether. The US EPA posted the Cancer Assessment Review Committee’s report April 29th, 2016, along with more than a dozen other Glyphosate-related documents, to Regulations.gov, an on-line document repository for America’s federal agencies. Then, after the EPA Review Panel Report had been widely spread on social media, the report by Cancer Assessment Review Committee, and OTHER DOCUMENTS, were removed from the EPA web-site on the afternoon of May 2nd. Preliminary Glyphosate documents were inadvertently posted to the Agency’s docket. These documents have now been taken down because our assessment is NOT FINAL. Some of the OTHER DOCUMENTS the EPA briefly made public pertained to two meetings regulators held with Monsanto representatives in the year after the IARC review was published. A slide presentation made at one of these meetings by Monsanto representatives indicated the company may be willing to make voluntary changes to the labels of its Glyphosate products to address concerns that they’re harming the habitats of certain pollinating insects, including the monarch butterfly. Julianna LeMieux is an Assistant Professor of Biology at Mercy College and Editorial Assistant for the Infection And Immunity Journal. Ph.D. Tufts University, School of Medicine in 2008. Expert Panel Of Scientists And European Food Safety Authority Have Also Discredited IARC ! 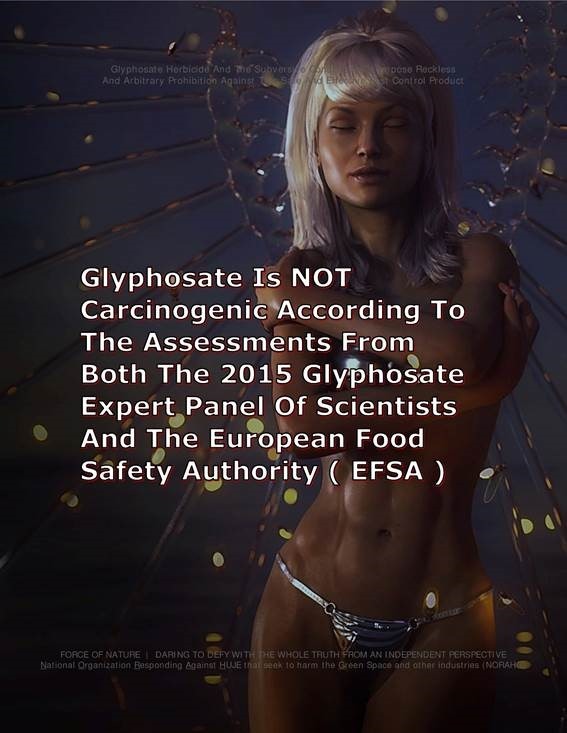 GLYPHOSATE IS NOT LIKELY CARCINOGENIC according to the assessments from both the 2015 Glyphosate Expert Panel Of Scientists and the European Food Safety Authority ( EFSA ). Both organizations also DISCREDITED the anti-Glyphosate report by International Agency For Research On Cancer ( IARC ). On March 20th, 2015, the IARC’s report arbitrarily classified the herbicide Glyphosate, the active ingredient in Roundup, as PROBABLY CARCINOGENIC on the basis of LIMITED EVIDENCE. IARC’s use of the term LIMITED EVIDENCE clearly implied that its report was SEVERELY FLAWED, DISTORTED, and UNBALANCED. Here is a summary of the findings of the 2015 Glyphosate Expert Panel Of Scientists ― • Glyphosate will NOT cause cancer in lab rats • Glyphosate is NOT genotoxic • studies DO NOT show a link between Glyphosate exposure and cancer. IARC’s Anti-Glyphosate Report Has Been Discredited ! IARC HAS NOT PROVEN that Glyphosate causes cancer. IARC has NOT classified Glyphosate as Group 1 – Carcinogenic To Humans. Additionally, IARC arbitrarily classified glyphosate as « probably carcinogenic » on the basis of « limited evidence » of cancer. Unfortunately, pesticide-hating fanatics have implied that IARC’s « limited evidence » has somehow been withheld from EVERY science-based national regulatory agency in the world. Nonetheless, IARC has NOT classified Glyphosate as Group 1 – Carcinogenic To Humans. In other words, ACCORDING TO IARC, GLYPHOSATE WILL NOT CAUSE CANCER ! And we repeat, IARC has NOT classified Glyphosate as Group 1 – Carcinogenic To Humans. Glyphosate WILL NOT cause cancer ! According to U.S. Environmental Protection Agency ( US EPA ), German Federal Institute For Risk Assessment, Health Canada, and EVERY other science-based national regulatory agency in the world, the weight of evidence is AGAINST carcinogenicity. The IARC’s anti-Glyphosate report of hazard did NOT indicate the risk of getting cancer. The IARC’s anti-Glyphosate report merely looked at what is called hazard, and NOT risk. IARC DID NOT take into consideration how much of, or how commonly, a risk Glyphosate poses in the real world. IARC failed to provide any new research concerning Glyphosate. If the IARC’s anti-Glyphosate report was truly valid, then why hasn’t WHO itself demand more government regulation ?!?! Why should national regulatory agencies listen to IARC when it continues to be ignored by WHO ?!?! Why ?!?! Because, Glyphosate WILL NOT cause harm and WILL NOT cause cancer ! For the whole truth about IARC, go to the next segment. 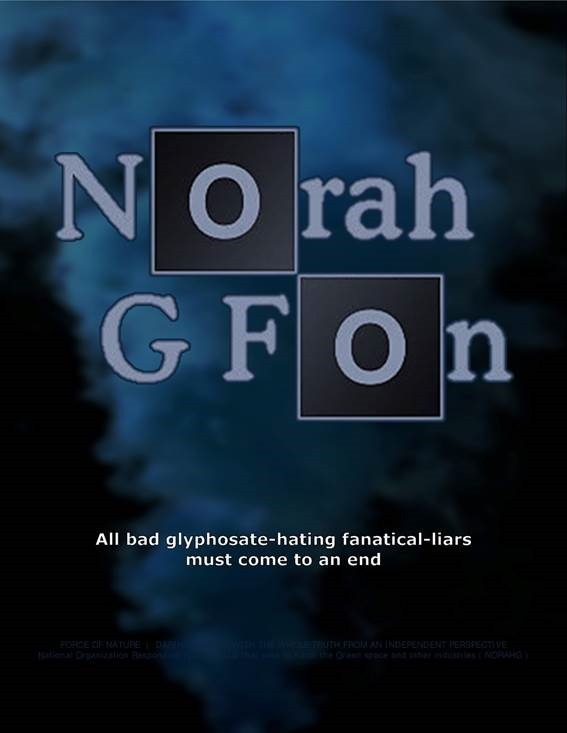 Glyphosate: Facts are very hard to find in the Glyphosate fear-mongering campaigns. When a herbicide so beneficial to farmers is less toxic than salt or vinegar, would entail a personal daily consumption of over 400kg of fruit and vegetables to pose any health hazard and has been subject to thousands of studies, and still suffers relentless attacks from those without toxicological backgrounds, it is evident that stupid has reared its ugly face. Stupid even got inside of IARC, but that apparently is not very difficult. Force Of Nature Reports & Blogs were launched by NORAHG for CONTINUOUS transmission on the Internet on January 1st, 2009 ― however, the VERY FIRST Stand-Alone Force Of Nature Report was issued on September 19th, 2008. The Reports & Blogs from Pesticide Truths, Uncle Adolph, and Force Of Nature, in some ways, are like Google for everything concerning the SUBVERSIVE ACTIVITIES of Anti-Pesticide and Enviro-Lunatic Terrorists. Many of these Reports & Blogs provide a sequence of historical events WITH COMMENTARY, the neutrality of which might be disputed. When lies, false allegations, and terrorism against pest control products are left unanswered, they risk becoming accepted as conventional wisdom ! What have YOU done in the war against Anti-Pesticide Terrorism ?!? !